In the present work, Mike Bidlo has looked to the Italian conceptual artist Piero Manzoni (1933-1963) and his 1962 print portfolio, 8 Tavole di accertamento (8 Tables of assessment), as a source of inspiration. Bidlo has taken the concept of appropriation and has added a twist, for what clearly appears to be Manzoni’s right thumbprint, is in actuality Mike Bidlo’s own thumbprint. As opposed to Bidlo appropriating Manzoni’s thumbprint, Bidlo has appropriated Manzoni’s concept (and format), thus begging the question: Is the observer simply viewing the work, taking for granted it is Manzoni’s thumbprint appropriated by Bidlo, or is the viewer actually looking at it? 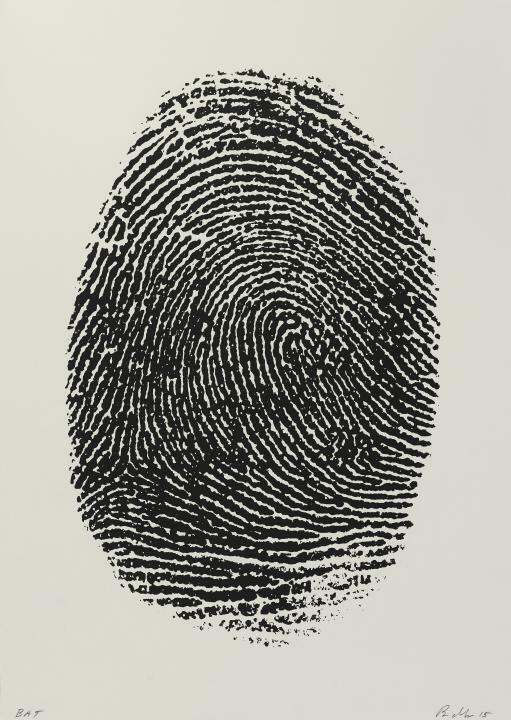 For Manzoni, the fingerprint was the most minimal physical trace of the artist imaginable – one that symbolized the unmistakable identity of the individual and the artist. Mike Bidlo has borrowed Manzoni’s concept of raising his fingerprint image to the level of art through the printing process but by utilizing his own fingerprint in the same format, Bidlo has wryly made it his own artistic postulation. Erdos, Elleree. "Imitation Games: Mike Bidlo and Piero Manzoni", article in Art in Print magazine, Volume 5, Number 4, November - December 2015, p.27, illustrated (another example). Also follow the link here.